Earth is truly nicknamed at the “Blue Planet” because there is no other planets know to have so much of water. The word ocean comes from Oceanus, who in Greek mythology was the son of Uranus, god of the sky, and Gaea, goddess of the Earth. Oceanus was also the river they believed surrounded the flat Earth. We have divided this huge water body into the Pacific, Atlantic, Indian, Arctic and Southern oceans, but in reality, they are all connected as one vast ocean. · CLIMATE: The oceans affect climate as water warms more slowly than land, and cools more slowly than land, also islands and the coasts of continents have cooler summers and warmer winters than inland areas. · SALT: on an average, each liter of water contains about 35 g of salt, although shallow, warmer seas are usually saltier. · LIGHT: Sun light allows plants to grow underwater to a depth of about 200 m. below this, the waters get darker the deeper you get and plants cannot grow. · PRESSURE: The deeper you go in the sea, the more pressure or squeezing force, there is. · TEMPERATURE: the surface temperature of tropical seas is about 250 C, and in most other seas about 170 C in summer and 100 C in winter. The temperature at the bottom of the ocean is 20 C.
· SOUND: Sound travels at a speed of 1,531 m per second under water – four times faster than it does in the air. Our oceans are divided into different zones, depending on their depth. From the sunlit zone to the deepest depths, a variety of marine life can be found. · SUNLIT ZONE: Most sea animals live near the surface where there is lots of light. Fish live off plankton and in turn they are eaten by larger predators. · TWILIGHT ZONE: From 150 m to 1000 m it is known as the twilight zone. Many creatures living here produce their own light and glow, either to attract prey or scare predators. · DEEP OCEAN: Even at the greatest depths, 10 km below the surface, strange animals lurk on the dark sea floor waiting for dead things to fall from the waters above. OCEANS: The Ocean’s deepest point is the Challenger Deep in the Mariana Trench, in the Pacific, at a depth of 11,034 m (36,200 ft). In the deepest trenches, springs of hot water, called black smokers, gush clouds of chemicals up to 4000 C from the seabed.70 % of the Earth’s surface covered by oceans and seas. 97% of the world’s water in the oceans – 2% is ice and only 1% is fresh water or water vapor in the atmosphere. There are about 30,000 islands in the Pacific Ocean. Some are the peaks of underwater volcanoes. The largest mountain on Earth is Mauna Kea, a volcano in Hawaii. At 10,205 m (33,480 ft), it is much taller than Mount Everest but most of it is underwater. 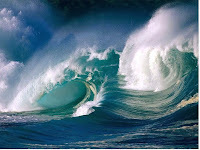 SEAS: Seas have a specific feature and form a part of a larger ocean. They are shallower than oceans, with no major currents flowing through them. Seas have salt water, but names can be confusing. One of the world’s saltiest seas, the Dead Sea in Israel, is actually a lake because it is not connected to an ocean.